I imagine all of us have memories of a gathering of friends or family, a warm summer night, a blazing fire, and the delicious taste of roasted marshmallows or s'mores! Mark and I were able to have one of those evenings last weekend, and it was heavenly. 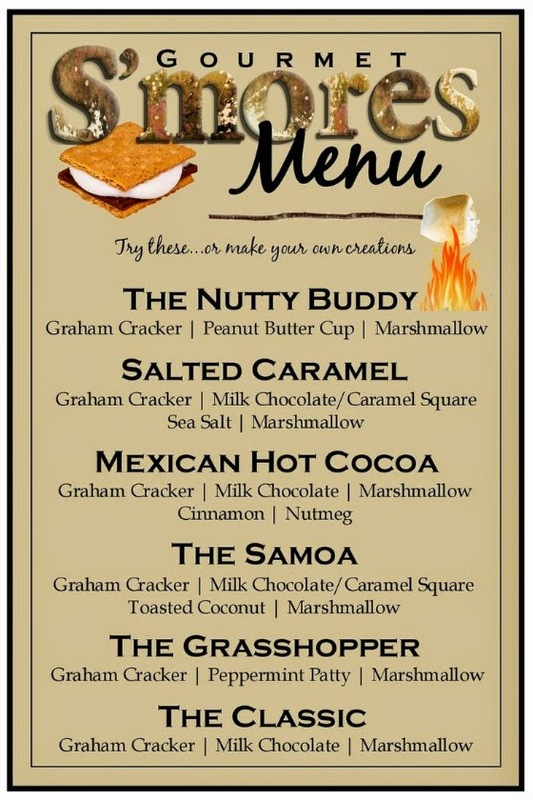 Tuesday I posted the "S'mores Dessert Bar -- Edition 1." I illustrated how we made a long 6' x 18" roasting table for s'mores that is perfect for a large gathering of friends or family. In this blog post I'll show a smaller alternative which is ideal for smaller groups, but first I'll list some advantages I've noted for roasting marshmallows over sterno cans instead of a large fire pit. Sterno cans don't create smoke; fire pits do. Sterno cans light immediately; lighting and keeping a larger fire lit can be a battle. Marshmallows catch fire and burn more easily over a fire -- light golden brown over sterno cans. Sterno cans are a little safer for little ones than a raging fire. Foil was placed on top of the sand. This isn't particularly necessary, but it will make it easier to take the decorative rocks out and replace the sterno can when needed. Some polished river rocks were purchased at Hobby Lobby and placed on top of the foil and sand. This S'mores Dessert Bar is perfect for smaller crowds and smaller people. It can be placed on a lower outdoor side table so that little ones can participate more easily. I made this one for three of my grandchildren that will be visiting in a few weeks. I can't wait to roast some marshmallows and make s'mores with them! There you have it! A S'mores Dessert Bar idea for a large gathering or this idea for a smaller group. Two great alternatives for summer fun!